Alright, alright. I should have learned my lesson from last weekend all of the previous weekends that getting work done/any sort of productivity doesn't really happen after Thursday (....or Monday). So rather than having a post on cultural appropriation for today like I had planned, I'll just leave you with this photo from the souk in Fes, Morocco, where I spent the entirety of yesterday exploring rather than working on this post. Fes is an incredibly beautiful (and ancient!) 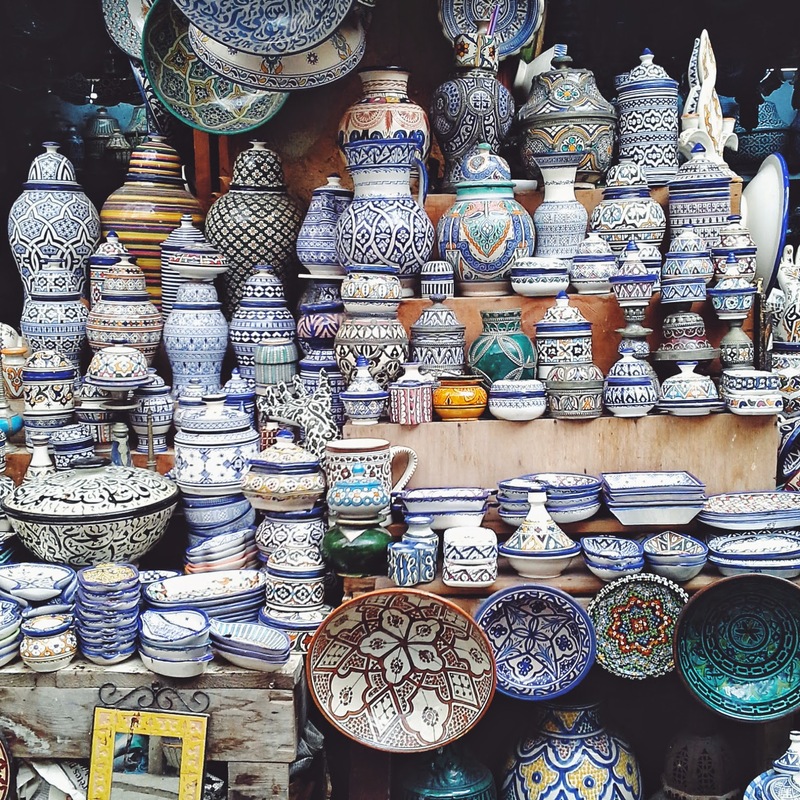 city built into the rolling hillside and is home to endless art, architecture, and handicrafts--it has the largest tannery in all of Morocco! I will be uploading more photos to my Instagram from my recent travels if you'd like to explore, too! In any regard we (the blog & I) have quite a bit of exciting upcoming content for the month of February so stay tuned! Now I should probably publish this post before I pass out on my computer....happy Sunday! Oh what a beautiful shot! Ohh, i love that photos! That looks amazing really! Thank you! The photo doesn't even do the place justice! Can't wait to see more of what you bring us this month! The potteries are really beautiful, they will make such exquisite home decorations with practical usage! Thanks for sharing! The photo is absolutely stunning!!! So glad I stumbled upon your blog!!! <3 and you always leave the sweetest comments! If just they weren't so fragile! ;( I would have brought a suitcase full of them--and so cheap, too! Oh my goodness I want every single one of those jars, vases, pots, etc! Love! I've always wanted to go to Morocco, its definitely towards the top of my list!